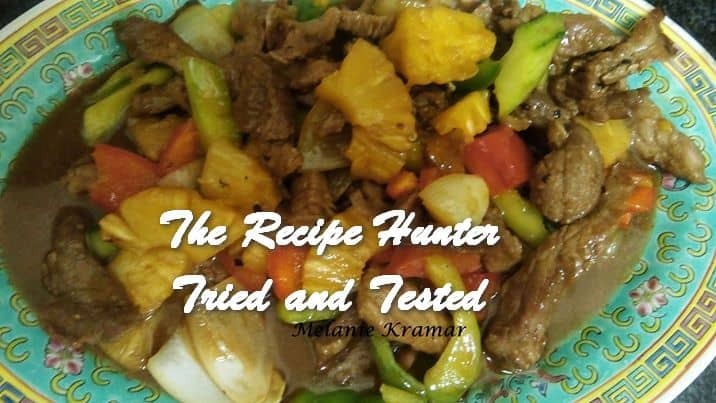 I always try to get out of making Chinese Food, despite it being my speciality, because preparation is somewhat of a menial task but I gave in today and made a fairly simple PINEAPPLE BEEF. It is usually served with rice, which is what I did but the family seems to think Chinese food must include noodles! You can serve it as you wish – it is enjoyable both ways. Slice beef very into very thin strips. Sprinkle bicarb over and set aside for 10 minutes. Slice onion and peppers into chunks. Rinse beef from all traces of bicarb, pat dry and marinate for 15 minutes. Add 1 tblsp oil to wok, add onion and 1 tsp garlic and ginger and stir 1 minute. Add peppers with a pinch of salt to taste and stir 1 minute and remove. Add cucumber and pineapple and stir 1 minute and remove and add to onion and peppers. Add 2 tblsp oil to wok, add other 1 tsp garlic and ginger stir few seconds. Add meat, let it fry 1 minute and then fry the other side for 1 minute and then stir till colour changes. Make well in the centre add sauce and allow to boil before mixing through. Add vegetables and mix through.